Luke heard the familiar hoot of the Land Rover's horn as he stuffed his lunch into his backpack. He danced over to turn the stereo off and closed down the air vent on the wood stove. 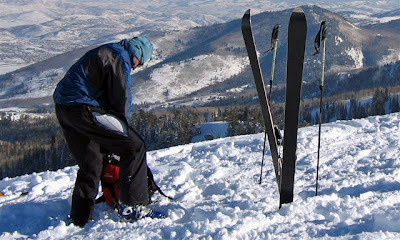 As he grabbed his skis and shouldered his pack, he reviewed his habitual mental checklist, 'skis, boots, poles, hats, gloves, gators, Pieps, shovel, climbing skins. . . .'. When he stepped out onto his porch, he hardly noticed the crisp, cool, morning mountain air suspending frozen particles of moisture that glistened rainbows in the sun. His attention was focused on the fluffy new snow he slid through as he ambled to the street where his long time ski buddy, Willie, was waiting in his trusty truck. They had met more than 10 years ago at the University, each with varied backgrounds and interests but with a shared passion for skiing of all varieties. Willie, a native of Northern Maine, was new to the western mountains while Luke was born and raised in the shadows of the Wasatch Range. Willie possessed many of the characteristics of the traditional north woodsmen. He was strong, silent and simple with a complacent wisdom remarkable for one so young. His scruffy brown hair and beard all but obscured his squinty bright eyes, ruddy Irish freckles and wind shingled lips. The rest of his hulky frame usually filled out layers of wool and cotton fashion older than L.L. Bean itself. Luke was the cosmopolitan, western version of the same spirit. A tall, slim, clean shaven perpetual-motion-music machine with dusty blonde hair, wide innocent eyes, and an easy, natural smile. His deceptively athletic frame was impeccably attired in the latest modern-miracle-material and style. Luke's easy going character and ability to play the fool endeared him to all, but inhibited any serious respect from those he revered. Their respective personalities counterpoised each other remarkably well whether they were at a fraternity barbecue or in a snow filled coulior. Willie's skill as a mountaineer and shear physical strength complimented Luke's knowledge of the local area and mystical intuition. As they rumbled down the unplowed road leading from Luke's cabin to the main canyon, their minds open and hearts anxious for the adventures of the new day. Willie drove slowly and deliberately, grinding through switchbacks and around potholes with a constant momentum. Luke scanned the radio dial for the, 'hypothetical, quintessential rock and roll tune,' switching stations wildly. His frantic efforts were abruptly interrupted when Willie pushed down the tape in the deck and filled the cab with scratchy bluegrass and off key country harmonies. Luke looked every which way, spotting deer, owls and hawks, snow sluffs, slides and fractures cut by an occasional wind swept ski track. Their excitement and anticipation increased the higher they drove until they pulled off onto a plowed, firm, shoulder of the highway. A long line of cars and busses passed them on their frenzied way to the ski resorts up the road. They quickly mounted their climbing skins, shed two layers of clothes, clamped their pack on, activated their Pieps and broke into the new snow on the barely discernable trail that led up the drainage. Climbing in silence through tight aspens, alternating the lead like pursuit cyclists with only the sounds of their breath and their avalanche beacons audible above the tromping of their skis and the soft song of the mountain breeze. Breaking their first sweet sweat, they settled into their own thought looking up occasionally to notice familiar landmarks. They passed the 'peace sign' carved into an aspen years ago when these trees were shorter and war was real to young Americans. Older proclamations of love, lust, and anger had been elevated above the snow pack by the maturing trees, and obscured by sap and bark. They passed the beaver ponds, the glory holes, and the mines indicative of the relentless spirits of the men and animals inhabiting the back country. They crossed from the warm, sunny aspen grove to the cool conifers on the north facing slopes, pushing, plowing, packing, testing and tasting the snow on their way. They paused to wipe the perspiration from their eyes and to peel off another layer. Breathing deeply, the thin, cold air, they could feel their pulses pounding in their temples and in their groins. Sharing swigs of water, they arched their backs and looked up patiently at their ridge line destination. Rising above the tree line, they powered into a zig zag traverse on a protected ridge that intersected the main ridge one thousand feet above them at a corniceless junction. Climbing, with a macho intensity, they paused only to reverse direction with a kick turn and to look around for signs of weakness in the snowpack or in their partner. Upon reaching the ridgetop, they rested again, changed their sweat drenched shirt and donned dry layers of shirts, hats, and gloves. Although the high altitude sun was very strong, obscured only by a layer of wispy high clouds, the wind on the ridge was persistent and quickly drained their bodies of all warmth. After adapting to the rigors of the ridgeline microclimate, they calmly surveyed the panorama that is usually unbelievable to those not accustomed to it. Standing on the top of their world, surrounded by blue sky and sawtooth peaks, they studied the terrain that had become so familiar to them. Theirs was a deeper appreciation of the beauty, the clarity, the majesty and menace of the terrain they viewed as one would eye a venerable old friend. Their inspection was a detailed analysis of shadows and shapes, of wind and its deposition, of bowls and couliors. When they looked at small towns spotted below them, they say familiar houses, cars, dogs, and people. When they looked at slopes and chutes, they saw all the previous turns they had done there. They perceived detail too small to see and compiled it with what they all remembered to determine where it would be safe and where the snow would be deep. The quiet intensity of the climb matured into the summit silence of the insignificant. They proceeded westerly along the ridge, keeping a safe distance from the cornice edge yet examining each and every slope's potential. Soon they began to feel more comfortable, more at home and they strength and their nerve. Willie pounds on one section and a large crack appears between his legs but he quickly scampers to the high side. A snow boulder the size of a Cadillac breaks off and starts a storm of snow cascading down the slope, exploding into a sugary cloud as it hits the trees two hundred years below. Standing on the ledge, Willie smiles his crooked smile but Luke just stares down at the twisted trees and suspended powder. The crash of the boulder broke some of the tired tension and they began to feel the joy, the excitement, and the adventure of the moment. They are anxious to ski so they shuffle down the ridge another half a mile to where the slopes to the north open up. They stand atop a bowl shaped like an inverted triangle and lined by thick pines that seem to hold all the snow and keep it protected from sun and wind. Luke threw down his pack in exhaustion and prepared for the descent. In a few moments, they stood at the edge with their tips cantilevered over the waiting pitch. With a wink and a grin, Willie leaped off the edge pumping his arms and legs wildly and landing into a pillow of pure fluff. His momentum seemed stalled and he momentarily appeared stuck but as quickly as he landed, he popped out of the drift and began a series of smooth, rhythmic telemark turns. His upper body remained calm and low with his hands out to the front as he shuffled his feet, almost kneeling on his inside knee as he cranked each turn. His speed remained unchanged as he stepped out away from the hill to initiate each turn and the muscular stress needed to maintain control was vaguely perceptible. He cleverly disguised his struggle with confidence, grace, and balance. As he approached the bottom, Luke could hear a muffled, choking, yodeled - scream of ecstacy. Willie pulled to a stop before entering the trees and turned to admire his serpentine signature etched in the mountain. He held his poles in the air and tapped them together three times, expressing his satisfaction and his anticipation of Luke's run. Luke gritted his teeth in determination, stretched his legs once more, adjusted his goggles and dove off the edge. He landed and exploded out of a spot 10 feet to the right of Willie's and began a synchronized crisscrossing of Willie's tracks, exactly 1/2 wave length out of phase, drawing an endless row of connected eights. He dove deep into each turn to check his speed and popped out of each carve to catch a glimpse of his location and a breath of air. He had alternating views of spewing waves of snow and Willie's smiling face getting closer, bigger, and brighter. Exhausted, he tumbled from his last turn into a entangled pile at Willie's feet but his friend quickly picked his up and shook him off. They looked up to the slope and laughed as they admired the most expressive symbol of the bond between them. 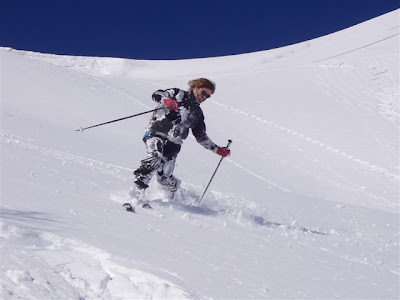 After a short respite, they donned their climbing skins again, shed their outer layers and happily began to break a switch back trail through the deep snow up the south end of the bowl. Trudging like mechanized tanks, taking short strong steps at a pace dictated only by the strength of their hearts and their lungs. At the top of the ridge, they suited up and shared an orange. Once again, they flew and crashed, recovered and turned, revelled and rested moving slowly across the bowl that was decorated with their toil, their joy and delicate creations. Their switch back trail up soon became packed solid, a veritable highway to the sky. The marks that they left, their impact on the slope was temporary for the wind had begun eroding their tracks immediately after they were made. Even the large cornice they sent smashing to the trees would be rebuilt quickly by the prevailing winds. A new storm would completely obliterate any trace of humanity, resetting the scene in pristine perfection. Luke and Willie eventually left the bowl and moved down the ridge examining the countless opportunities for descent. 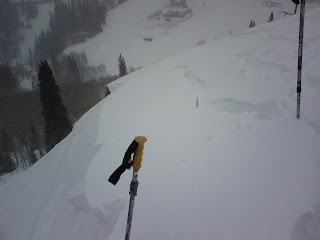 Luke had visualized every detail of Dutchess Draw and would not be tempted by any other bowl, no matter how deep the snow was. They stopped in a sheltered southwest facing alcove, dug a large pit and formed chairs with their rescue shovels. Sitting back with their feet propped up on snow ottomans, they absorbed the warm rays of the winter sun while they ate their lunches. Luke munched on an assortment of granola, raising, dried fruit, and nuts and washed it down with a high energy exotic fruit punch. Willie ate his traditional peanut butter and honey sandwiches and drank his frozen frosty beer. A sudden chill overcame them as the sun slid behind one of the afternoon clouds. They packed their trash, loaded their packs and mounted their skis. They traversed down the ridge further until they arrived at Duchess Draw where, for the last time, they prepared for the descent. 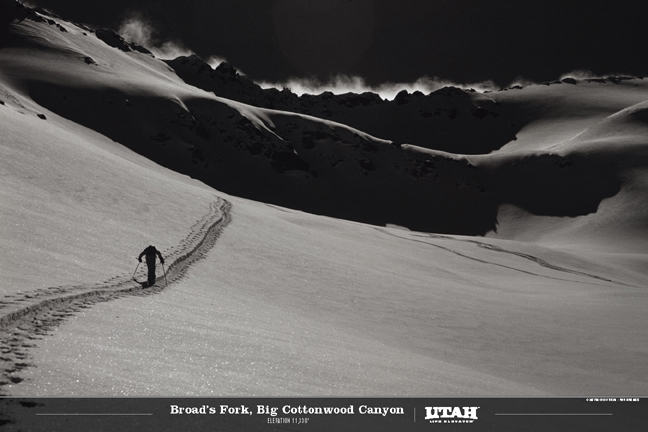 They stood at the edge looking down into the shadows and trees, planning their route, imagining their turns, recalling countless days spent skiing this very spot. Willie turned to Luke and nodded don the slope. Luke dropped his goggles down and leaped unhesitantly into the bowl. After slaloming several small pines, he faltered slightly, leaned far forward, and planted his face in a magnificent summersault, egg beater crash that sent snow and equipment flying. He stood up, collected himself, brushed off the snow and dejectedly skied out the rest of the run muttering to himself of nightmares and bad Karma. Willie frowned, sharing his friends disappointment and slid off the edge towards the center of the bowl. 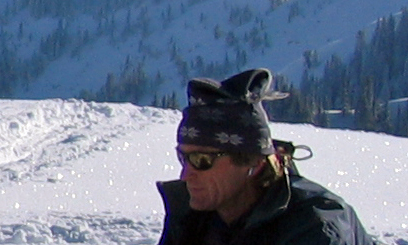 Luke watched as Willie linked several deep turns in the waist deep snow. Out of the corner of his eye, Luke noticed a huge fracture develop just below the cornice. He watched as the whole slope released at once turning it into a menacing wave of snow. Willie did one more turn before he noticed that the bottom had fallen out on him and he vainly attempted a quick traverse to the trees. His attempt was too late and he was swallowed up by the onslaught. Luke scampered out of the slide patch into the protection of the dense trees. He watched Willie disappear and a few seconds later, saw a ski shoot out of the snow cloud and splinter in the trees. The slide exploded into the pines at the bottom tearing up roots and branches before subsiding into an erie stillness. It ended as quickly as it started, in minutes or seconds or milliseconds, the slope was ravaged and Willie was gone! The severity of the situation overcame Luke as he screamed for Willie and for help. Entombed in dense, packed snow, Willie heard the screams and tried to answer. He could not move, he could not see, he could not breathe, he could not even tell which way was up. He tried to relax and wait for Luke to get him. The panic raising in his chest abated as he started to pray. A feeling of helpless bliss overwhelmed him and the last thing he heard before blacking out was the steady, rhythmic beating of his heart and the far away sonld of the beeping of his Piep. He gathered his wits and calmed himself as he reviewed the rescue procedure they had practiced. He kept thinking that if he didn't find his friend in 20 minutes, Willie would be dead. He reviewed the events of the slide in his mind and imagined the spot where he last saw Willie and his ski. He turned his Piep from transmit to receive and listened for the sound of Willie's beacon. He listened intently scanning the slope and twisting his Piep at all angles, hearing nothing. He scanned again and he heard nothing again. He climbed frantically up the slope towards the last sighting and heard nothing. Luke continued his climb for what seemed like an eternity, then stopped to listen again and he imagined he heard a faint beep off to the southwest. He attempted to move in that direction but his skis inhibited his progress so he opened his bindings and kicked off his skis. He found that he could maneuver easier on the dense debris without his skis and he moved towards the direction of the stronger signal. The signal got louder and louder as he walked south, then quickly faded away. He retraced his steps to the loudest point, turned ninety degrees and walked until the signal intensity peaked. He repeated this procedure five or six times until he had pinpointed the loudest point. He pulled his shovel out of his pack and dug furiously at the dense snow. His frustration and fear turned to rage as his folding shovel kept collapsing in the hard snow. Although the digging was very strenuous, he did not stop or rest and was soon five feet deep. He checked his Pieps and assured himself that he was in the right place. Suddenly, he saw the blue fabric of Willie's pack and found new strength in his elation. He screamed to Willie that he was saved and yanked on the pack. The pack easily pulled out of the snow and Luke saw the broken shoulder strap and the Pieps broken cord twisted around the shoulder strap. He threw the pack aside and jumped into the hole digging with his hands, blinking tears of rage from his eyes. He stood up hopelessly when he found nothing else, feeling that he had failed and betrayed the trust and confidence of the person he respected the most. He emerged from the hole and scoured around the area for any clue or sign of his partner. He tried his Pieps again but remembered Willie's disembodied Piep and threw his down. Overcome with loneliness and grief, he dropped to his knees and flailed the snow with his pole. He stopped suddenly when he felt his pole hit something solid. He crawled up a few feet and found the tip of a ski, Willie's ski! Again he began digging madly and tried to pull the ski out but it was anchored firmly. After further digging, a tattered ski boot appeared and he dove at the snow with all his remaining strength. Soon Willie's unconscious body was uncovered and his yellow lifeless face held a peaceful grin. Luke started resuscitating him while imploring him to breathe. Finally, Willie grasped, choked and puked into the snow. He looked up at Luke with tears in his eyes and smiled. After recovering much of their gear, they climbed out of the Draw, skied back down the ridge and over to the Land Rover. It was well after dusk when they nervously climbed into the truck. They drove down the canyon that once was so friendly, towards their homes, their lives and their loves. Willie reached over, turned the radio on to a rock 'n roll station and started to rhythmically tap the wheel. Luke looked at Willie, smiled weakly and turned the music down..